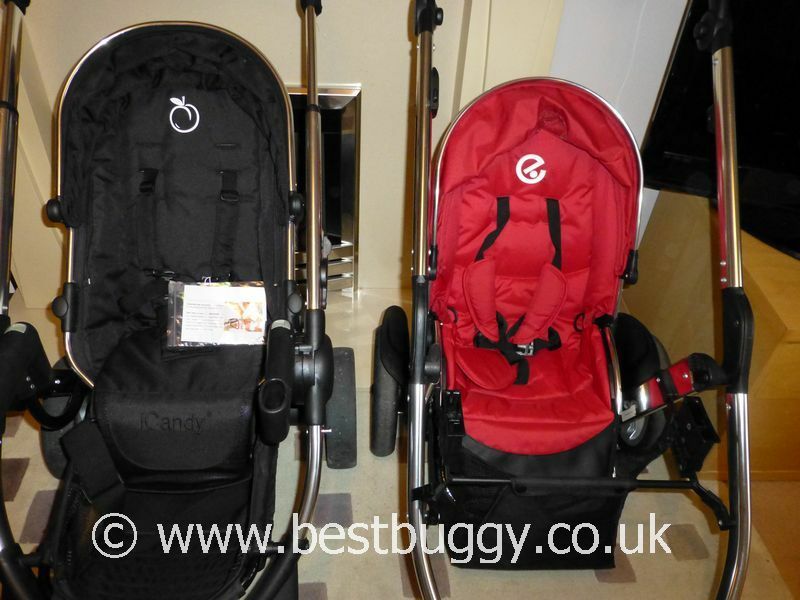 These photos show the iCandy Peach Blossom 2 (Black Magic) side by side with the Babystyle Oyster Max (Tomato). 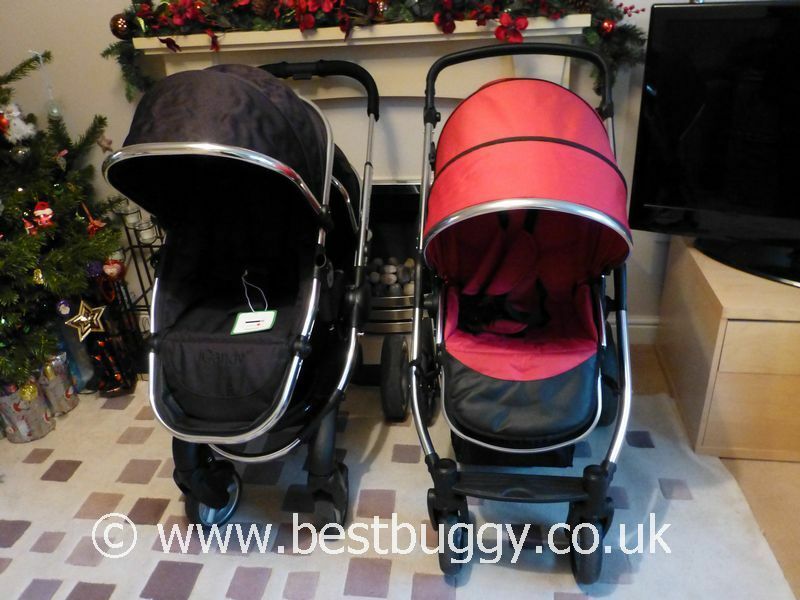 These two pushchairs are two of the best tandem pushchairs we have tested here at Best Buggy HQ for functionality, options and pushability. 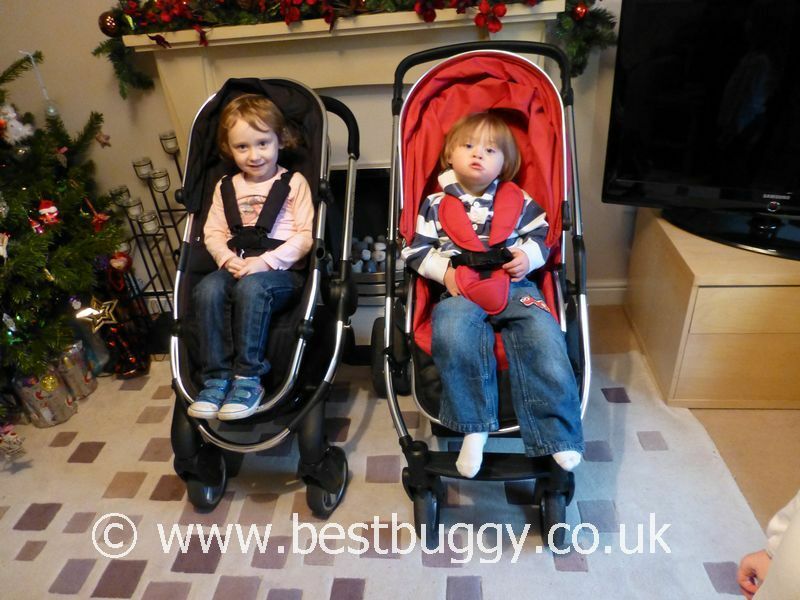 We really want the photos to do the talking here. 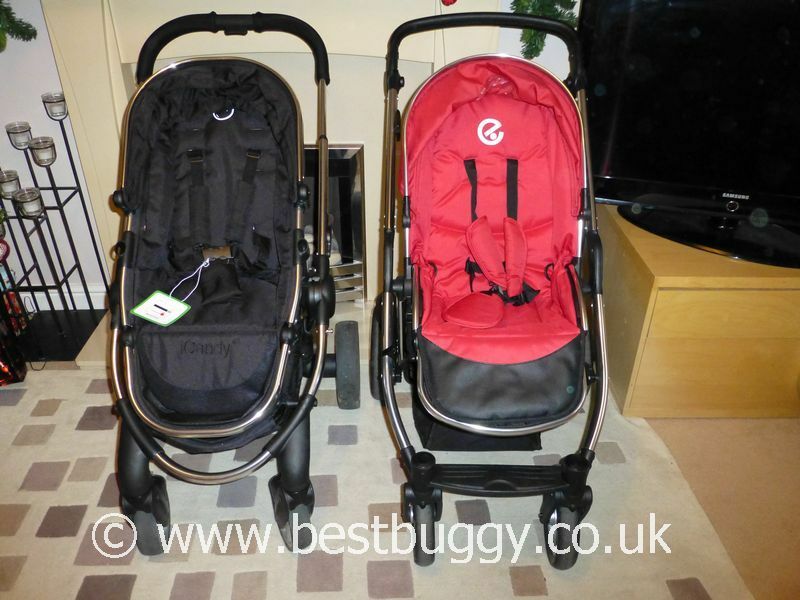 However it is vital that we point out that there is a big price difference between these two products, but this is also reflected in the quality and finish. 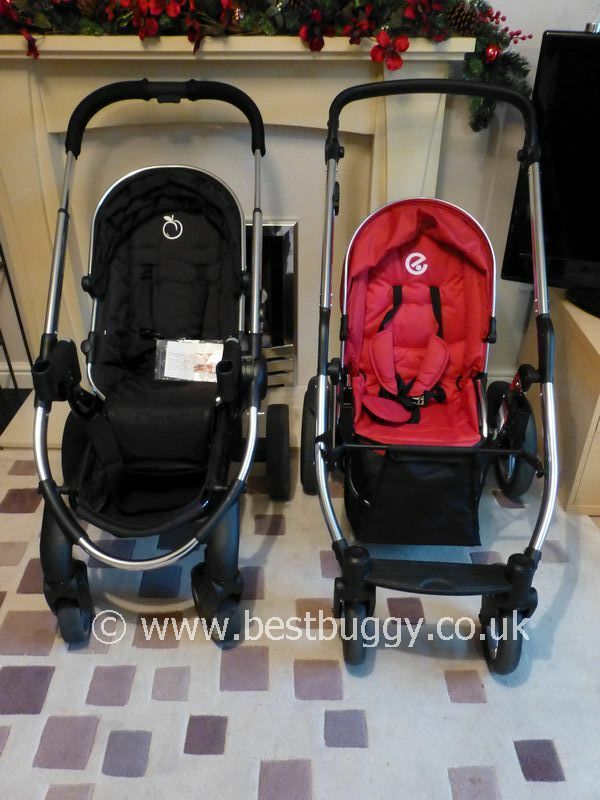 The iCandy Peach Blossom 2 is more expensive than the Babystyle Oyster Max. 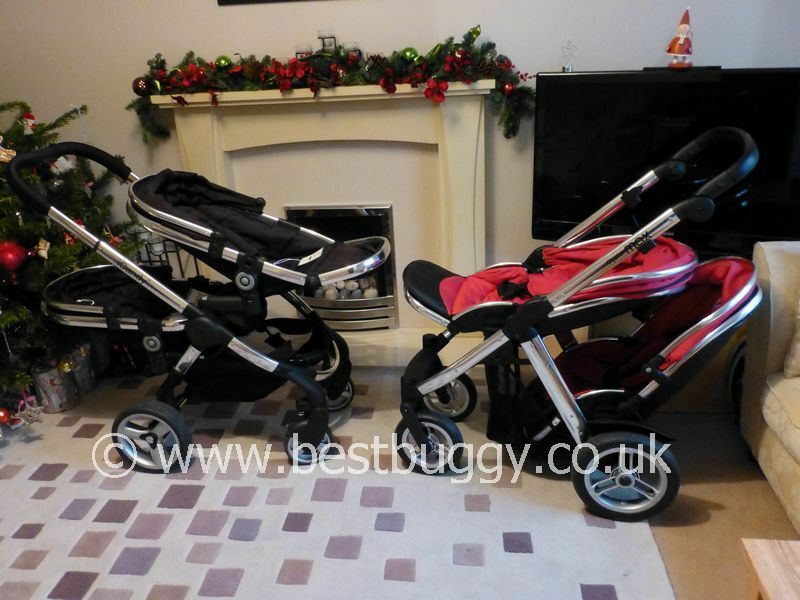 Here at Best Buggy, we dont always consider price – more what a pushchair does, and how well it does it. 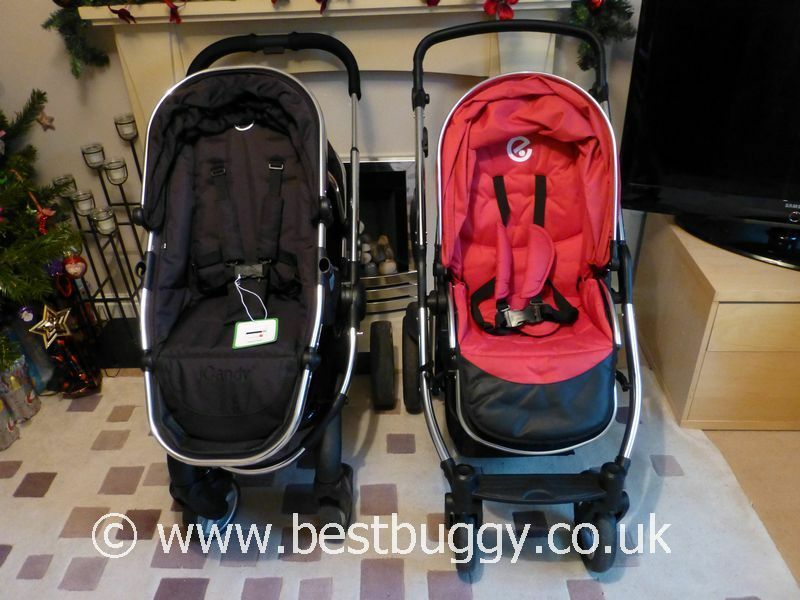 However with these two pushchairs looking on the surface, so similar, the price and what this reflects, is important to note. 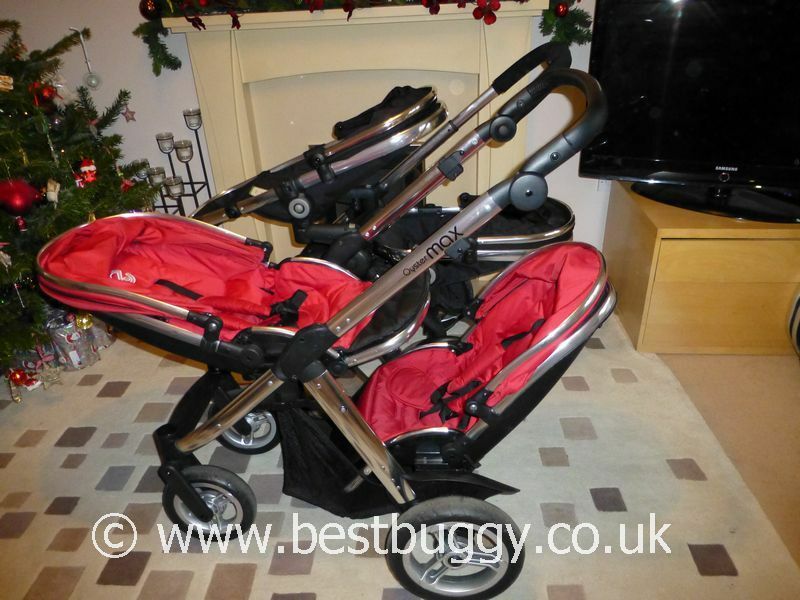 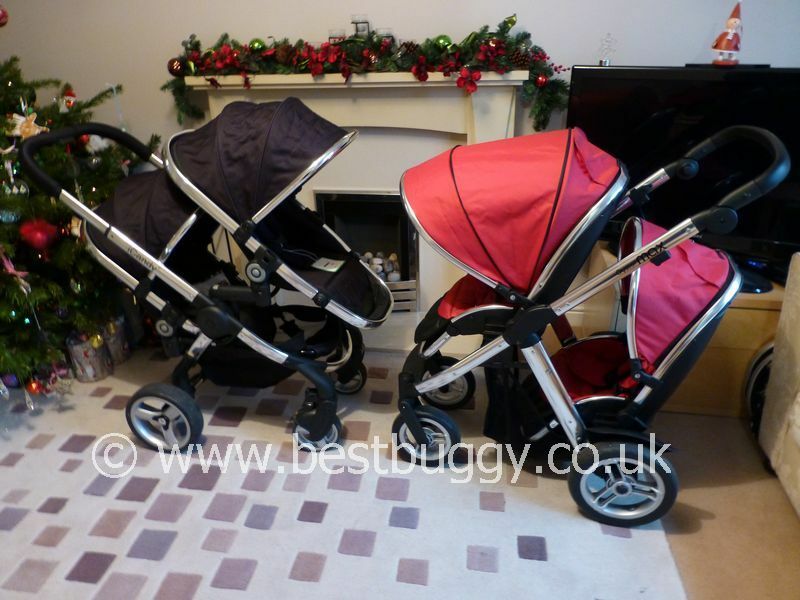 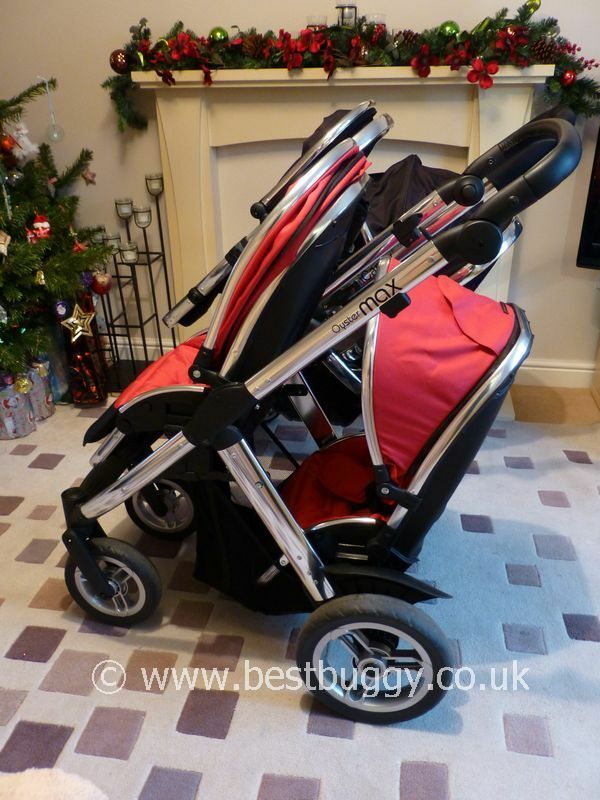 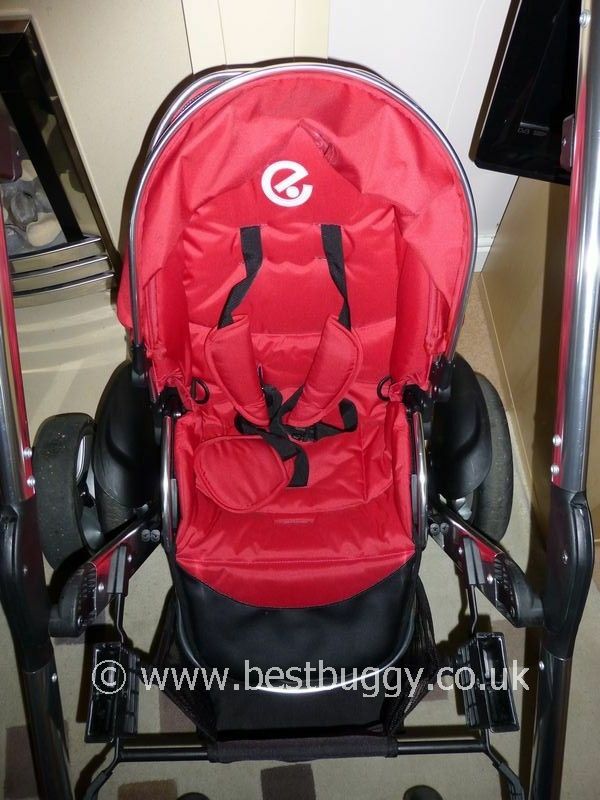 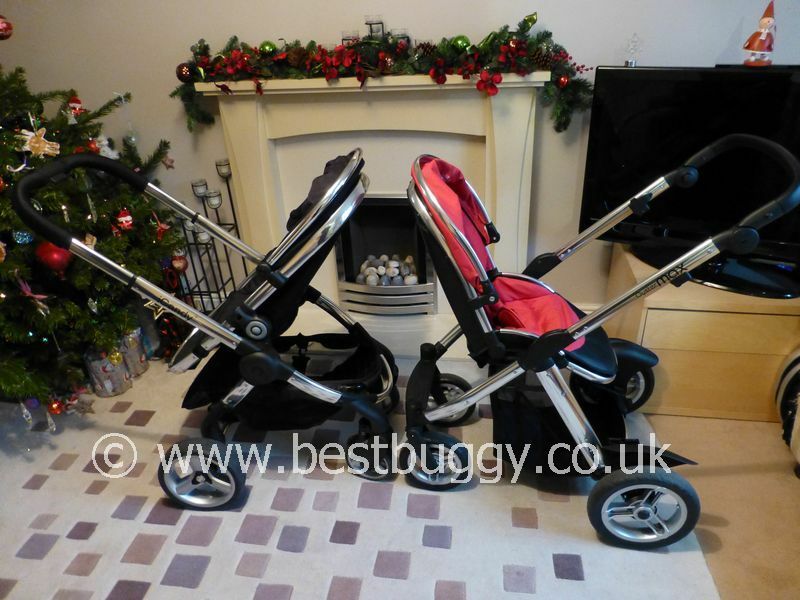 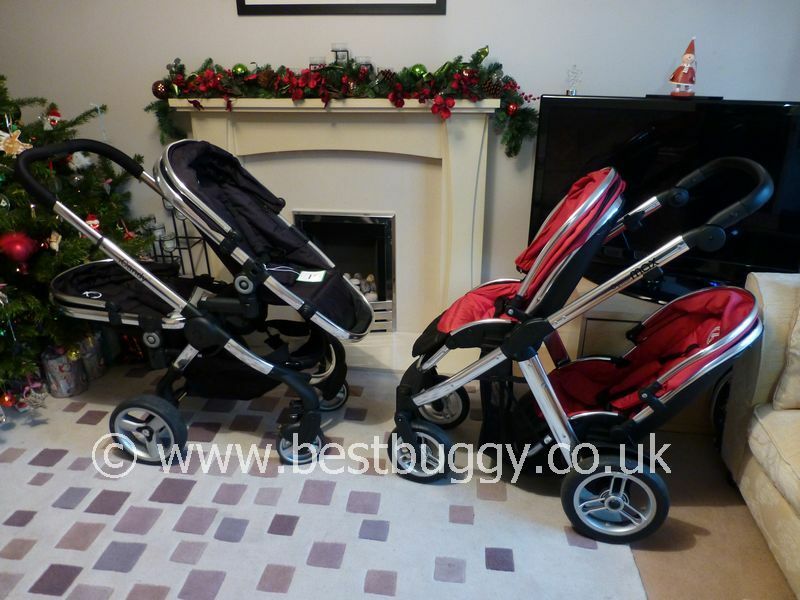 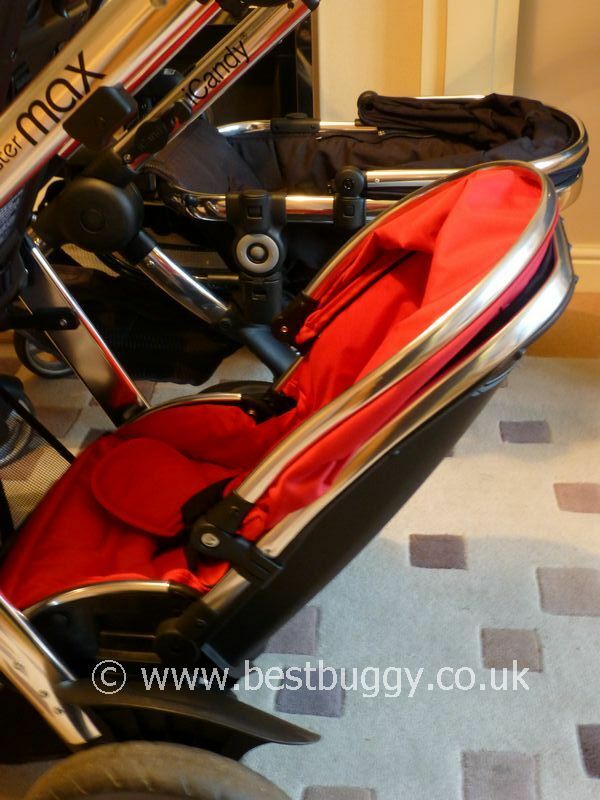 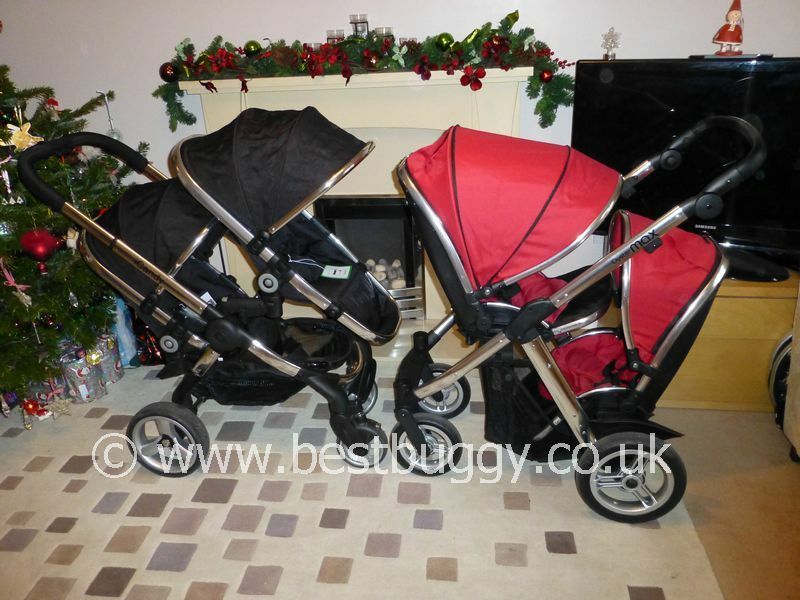 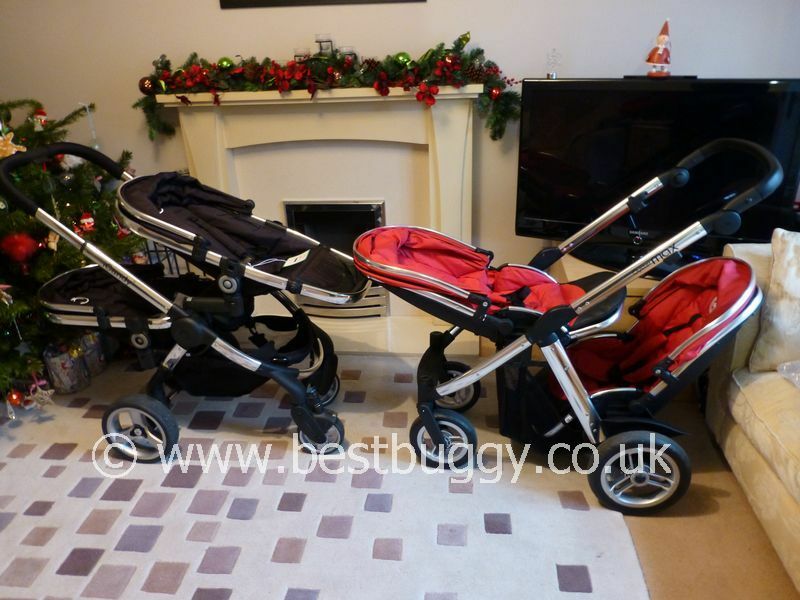 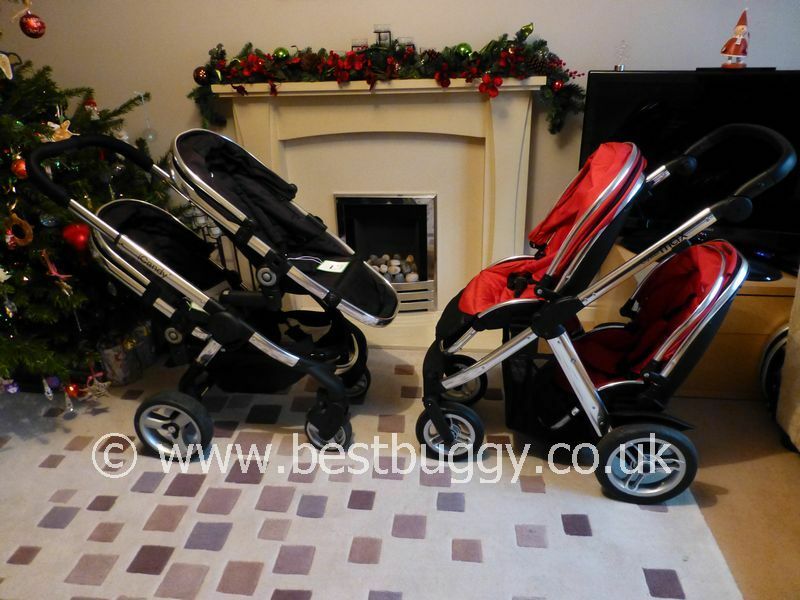 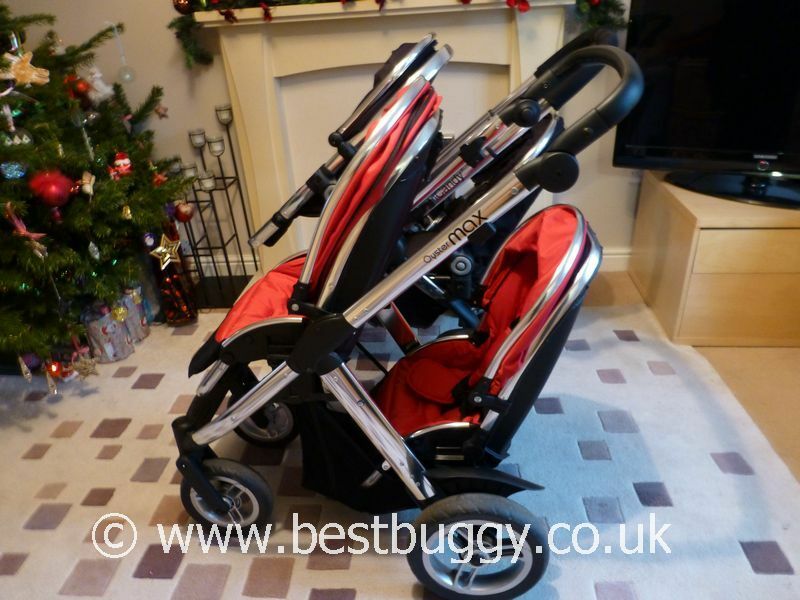 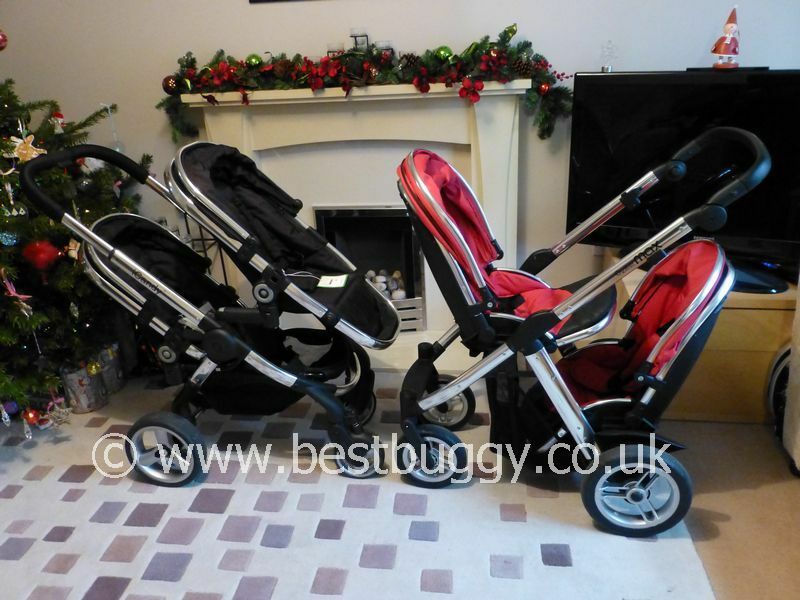 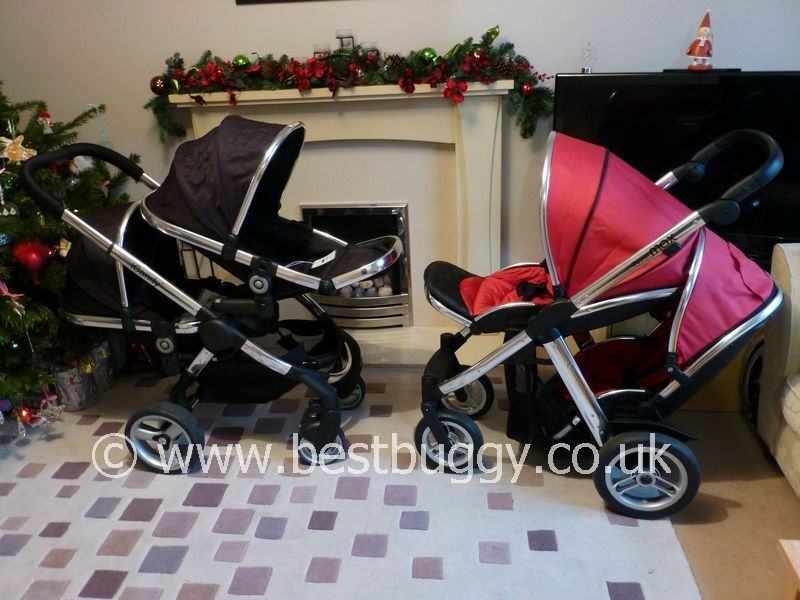 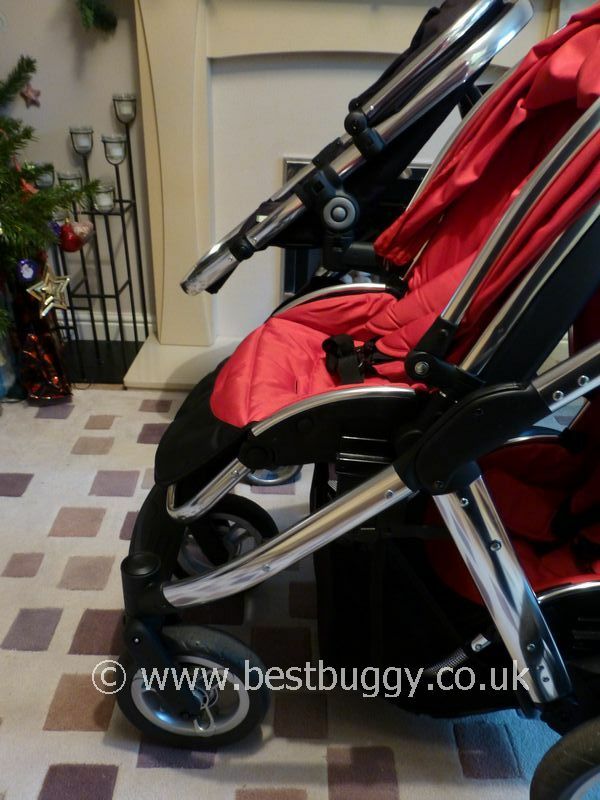 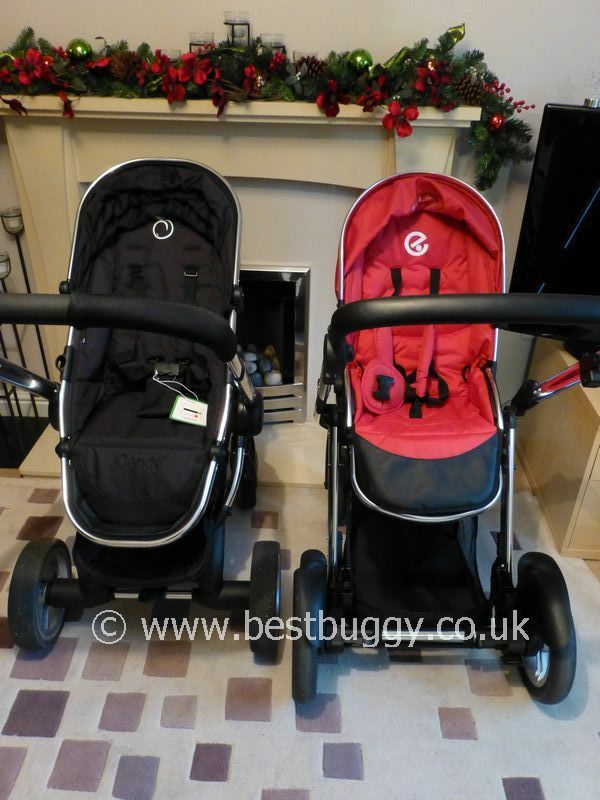 These photos show the iCandy Peach Blossom 2 and Babystyle Oyster Max in two seat mode – suitable from 6 months old. 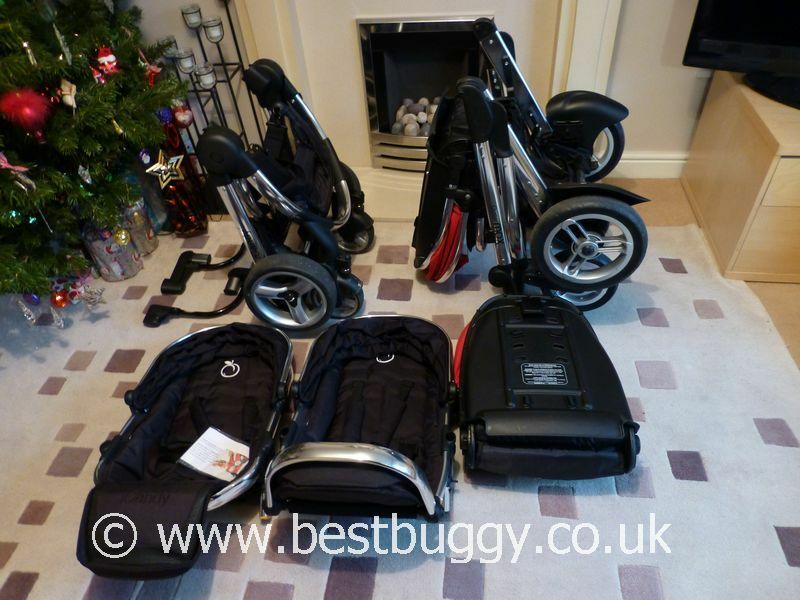 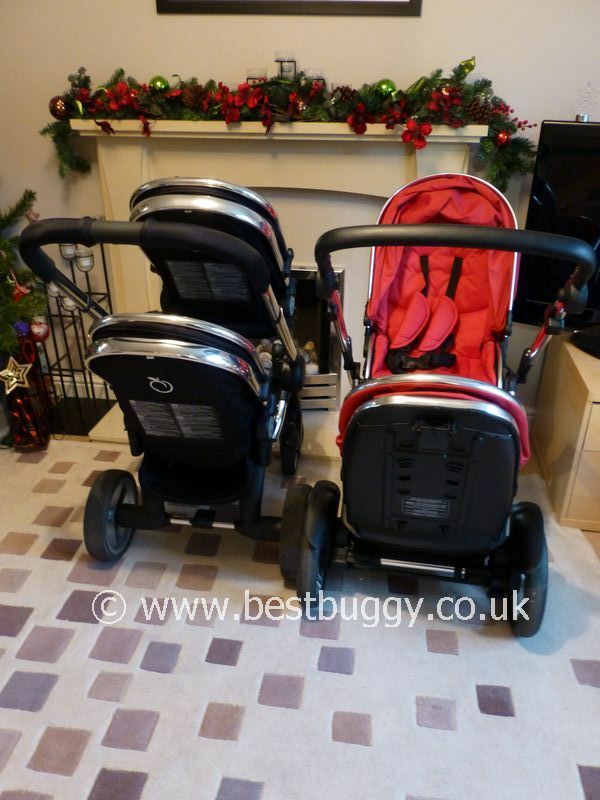 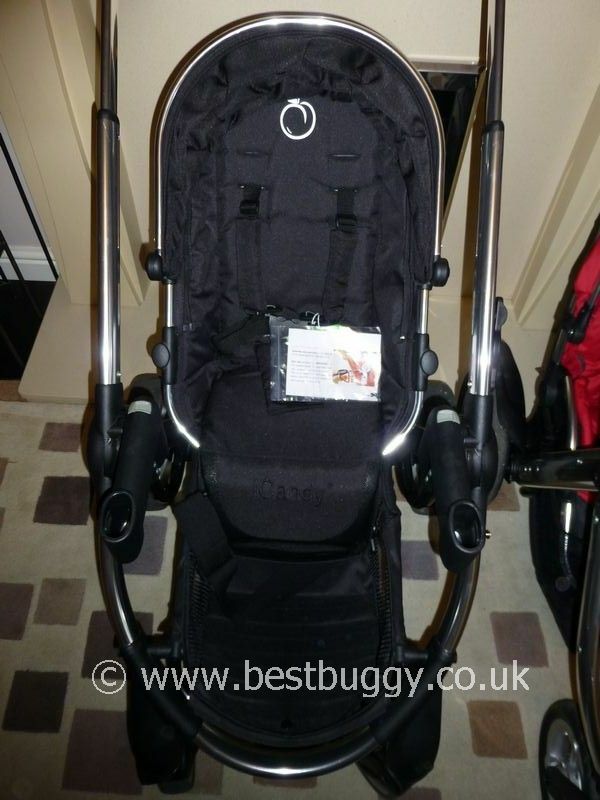 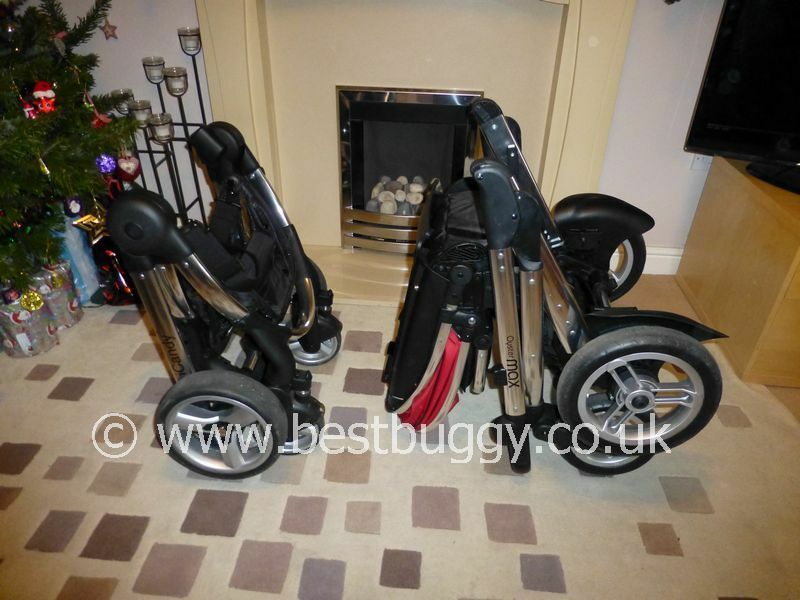 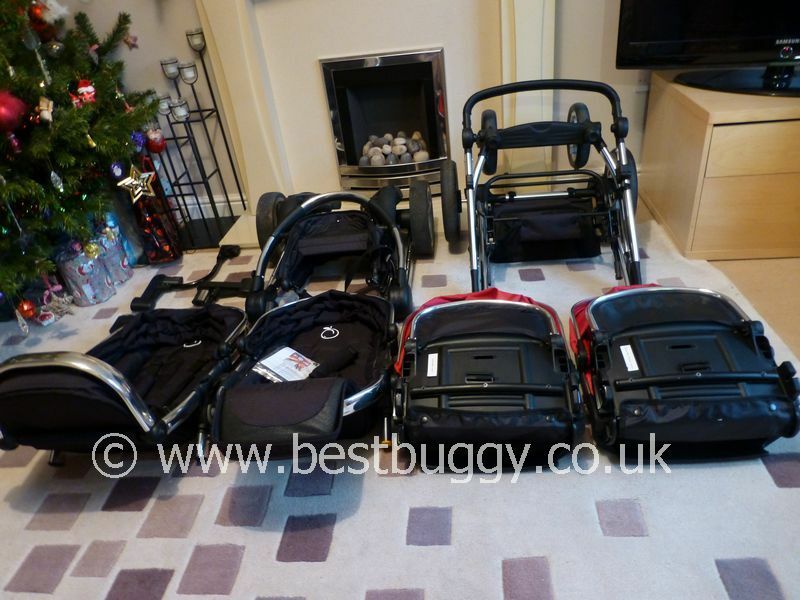 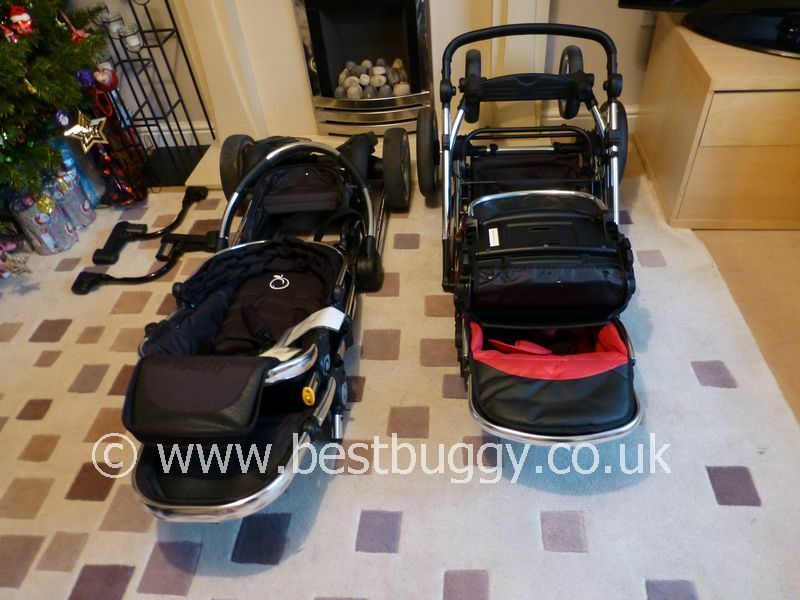 There are photos, reviews and more information about both these pushchairs, including photos of carrycot and car seat options (from birth), under the individual entries for these two pushchairs. 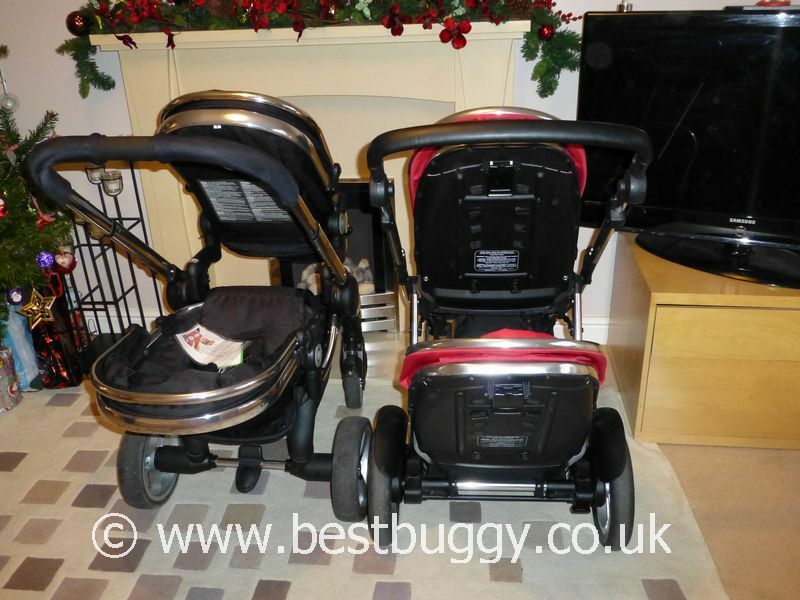 We urge you, to go and read our other information in order to understand both these pushchairs fully. 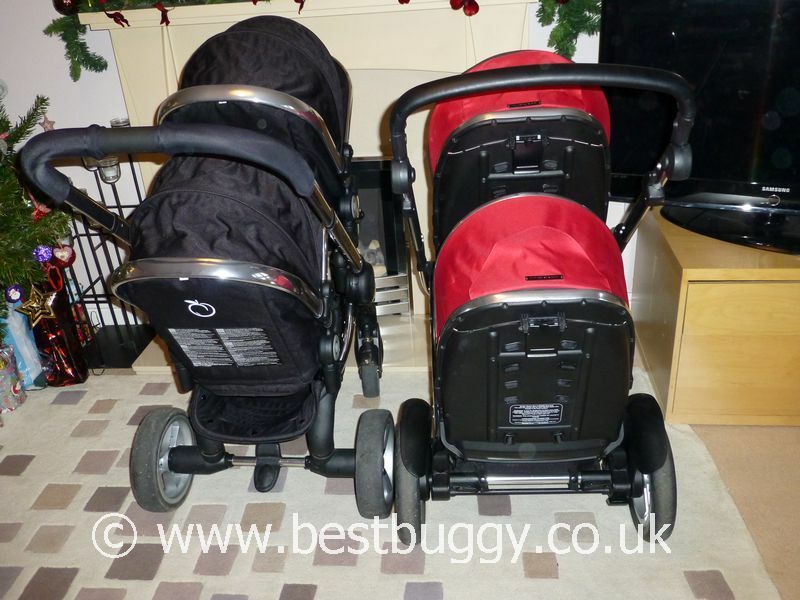 When considering these photos, please note that we have tried to line these two pushchairs up along the back or front axle. 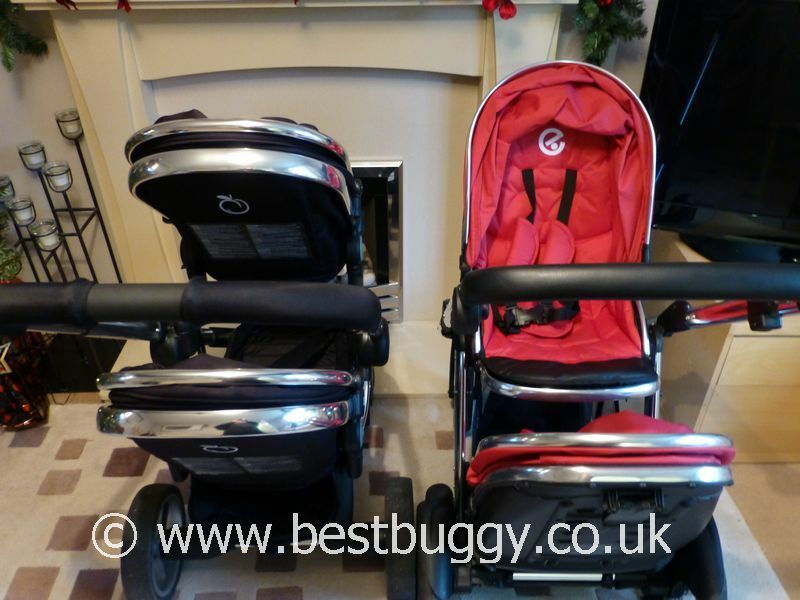 We have tried to put each pushchair into their corresponding positions eg maximum recline, hood opening, handlebar position etc. 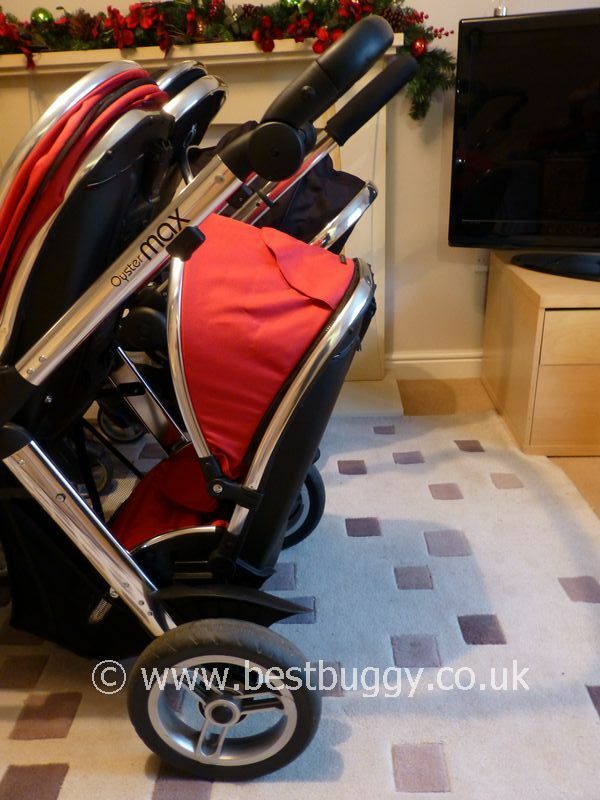 We suggest you look carefully at the seats; seating options and positions; reclines; hoods; basket; handlebar; footrests / foot room; and fold. 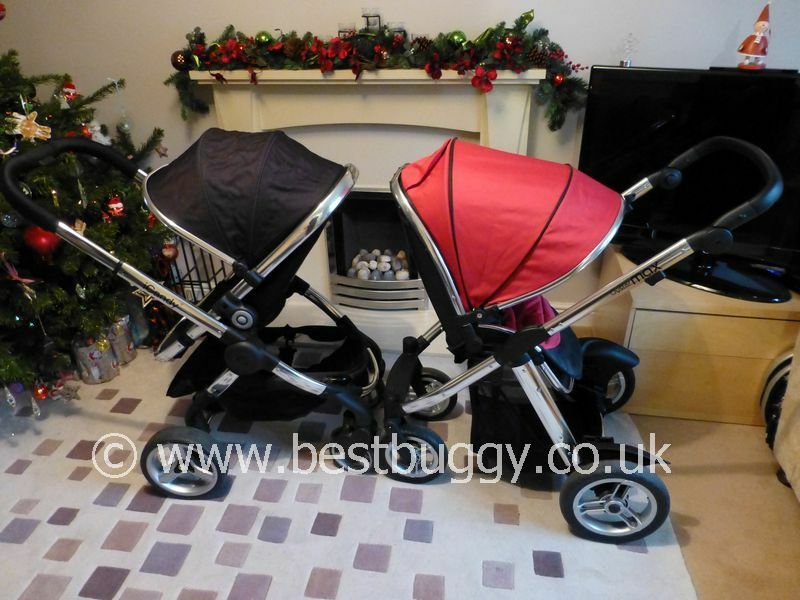 Both pushchairs come with one bumper bar, and two separate raincovers. 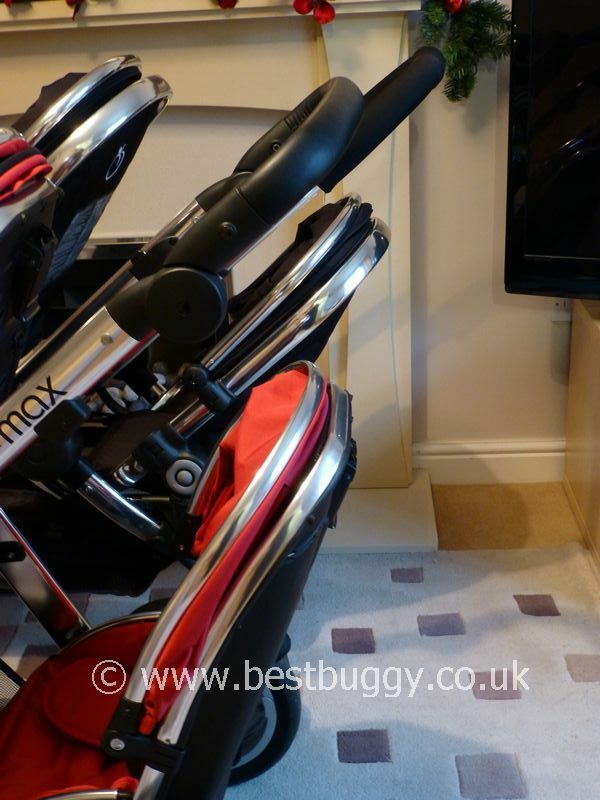 The Oyster Max also comes with an apron for a younger child. 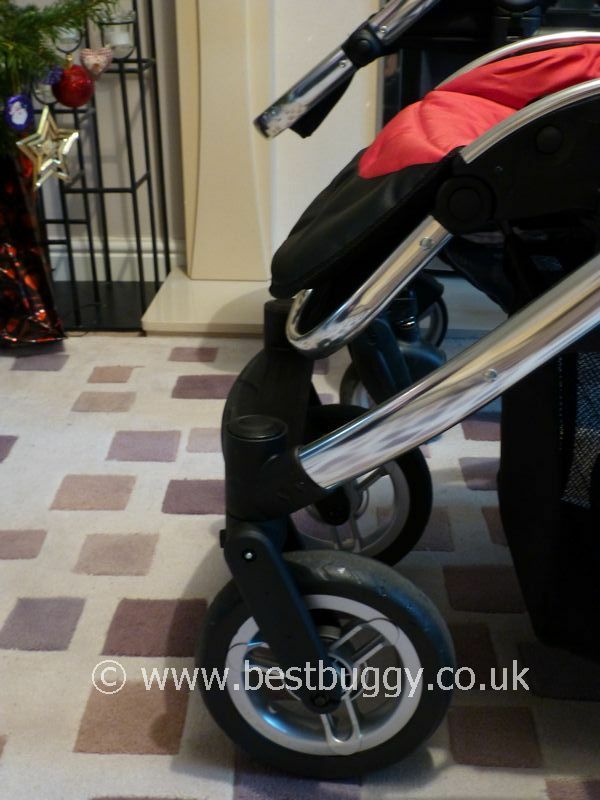 The handlebar covers on the Peach are not standard. 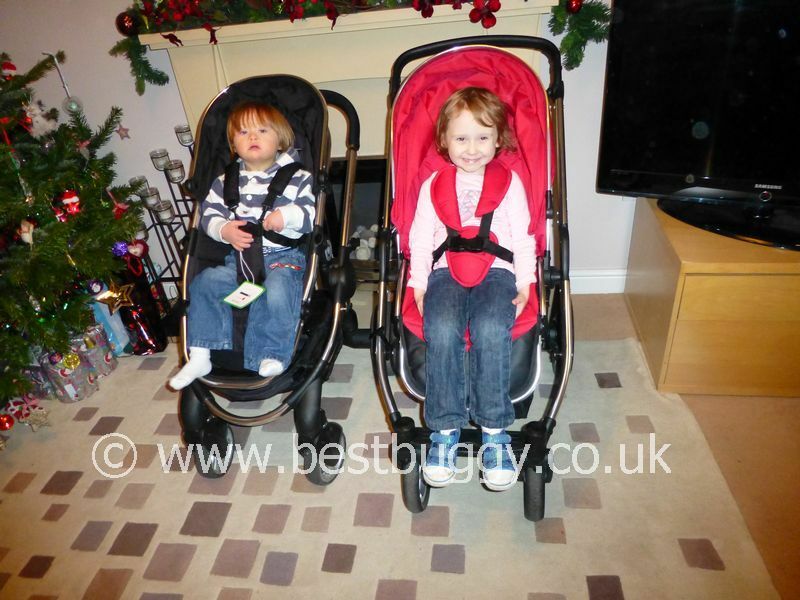 The boy is aged 2 years 5 months old (85.5cms tall) and the girl is 3 years 8 months old (101cms tall).